[…] Chez Robert is first of all an atypical showroom, a place where new artistic possibilities can be invented. 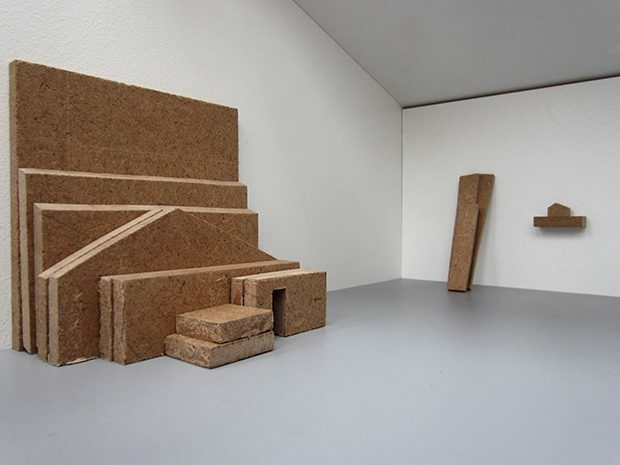 And this is by reproducing the model of this building that Matthieu Martin sets up a mechanism, a process which aims to re-use the scraps of his wooden construction in order to create another one, then another one, and another one… while stock lasts. With the rejects of his matrix, he builds classic exhibition furniture, stands, shelves and displays. This up-to-date plan, this demystification of the space/ gallery incites us to think the place like a set-up of fractioned plans, surfaces and materials. The geometrical cuttings stand against the walls, in an unstable balance between what exists and what comes to life. We grasp, in one look, the inner and outer selves of the structure that oscillates between sculpture and architecture. A double focal distance on what contains and what is contained, on the visible and the invisible. 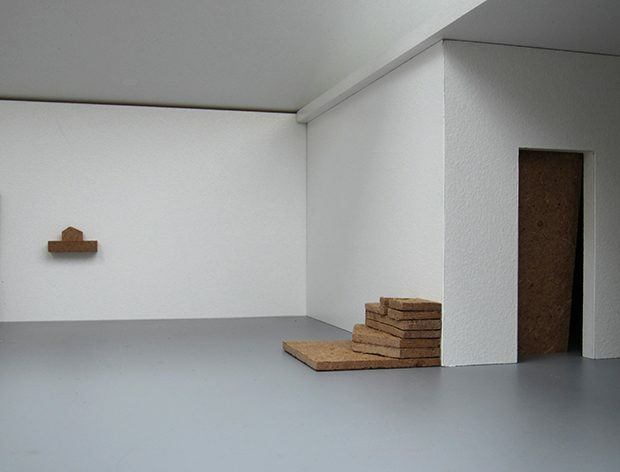 A setting up of an exhibition that becomes the exposed object; a prototype which turns into a work of art. The simulation is unfolded on the borders of a perceptible reality. To the scale of contemplation, Matthieu Martin casts a vision of a showroom that is prone to multiple metamorphoses.